The Sharp FO-4470 is intended for expanding businesses; the work group Super G3 fax, printer, scanner, and copier provide daily solutions to business process. The 2-in-1 integrated device is ideal for complex business practices; the device is a promising fax/copier designed to streamline the flow for growing businesses. The size of the MFP is 21.5 inches in width, 16.2 inches in depth, 13.6 inches in height, and a weight of 27.8 pounds; The fax/copier system will lay upon any desktop. The copy-rate of the Sharp FO-4470 is 16 pages per minute. The modem transfers fax data at 33.6 Super G3, and the memory capacity of the printer is eight Mega Bytes. The eight Mega Bytes will save up to 500 documents in the occurrence of a power failure. The face down printing eliminates the hassle of having to reorganize the papers when receiving faxes, copies, and prints. The ADF handles up to 50 pages. Duplex scanning is established. Scan speeds are swift at 1.3 seconds. Standard paper capacity is 250 sheets; the flexibility permits a total of 750 sheets with an optional drawer. Using the sheet feed is the procedure for using the scanner. The flexibility of the paper stock permits adjustment between legal and letter sized documents. The fax machine gives you a sense of security with the pin-enabled fax retrieval system. The Administrator password and Menu lock gives the owner control of authorized users to access the menu settings. The print engine is quite strong, and the fax machine wastes little time. On top of the main features, the remote diagnostics, auto-dial phone books, broadcast capability of 154 locations, and document memory backup adds to the efficiency of the well-round fax/copy machine. The front panel keyboard is straightforward with a two-line LCD; the LCD displays information related to the resolution and various messages. The panel notifies the user of toner levels and indicates when the copier is communicating. Below the LCD, the settings panel presents: a QWERTY keyboard, a numeric keyboard, contrast settings, resolution settings, line buttons, print hold key, menu button, copy button, job status button, duplex scan button, priority send button, broadcast button, start button, stop button, copy/help button, and menu navigation. 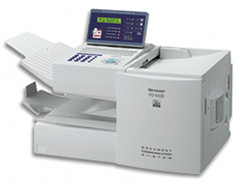 Since there is no PC connectivity, there are no complicated compatibility requirements to operate the fax/copier; it is a stand-alone device. The operational power consumption using this device is quite low at 580 watts; on standby, the power consumption is 10 watts. 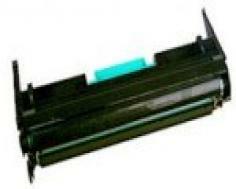 Included with the fax/copier are a single toner and single drum cartridge. 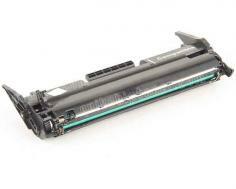 The toner yields 3,000 pages and the drum yields 20000 pages. The maximum paper size the copier can handle is 8.5 x 14 inches; the minimum it can handle is 5 x 5 inches. The fax/copier will dish out 99 copies perpetually; then you have to start the printing process again. The data compression system is made up of H2, JBIG, MMR, MR, and MH. The remote diagnostics provide the user to contact Sharp's Facsimile Automated Service Technology for troubleshooting in the event of fax/copy issues. The sad thing about the printing features; it does not allow PC printing, faxing, and scanning. PC connectivity is not available. While faxing and copying are essential features in the economy today, Sharp should of incorporated a network capability for the fax/copier network. There should be more high-end features for a printer that is priced around $500-$1000. The max Tx resolution is 200 x 400 dots per inch. It would be better if the max Tx were a resolution of 600 x 600 dots per inch instead. 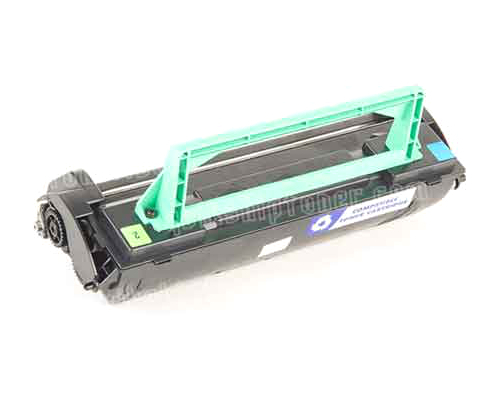 Review it: "Sharp FO-4470 "
Genuine FO-47DR drum cartridges will yield 20,000 pages and genuine FO-50ND toner cartridges will yield up to 3,000 pages. There are non-genuine drums and toners that are consistent with the Sharp FO-4470 which costs a fraction of the original price.